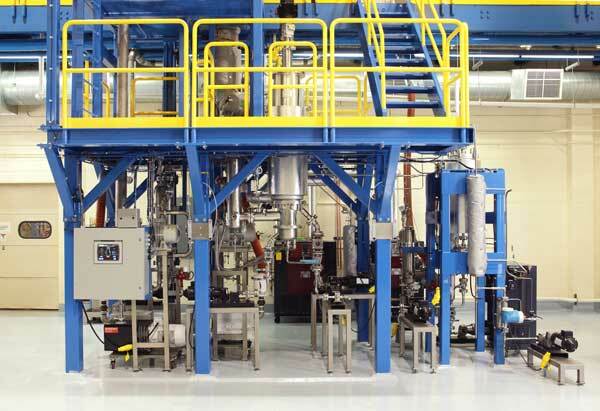 Providing Equipment, Services, & Technology to Labs, Pilot Plants, & Production Processing Worldwide For Over 50 Years. For more than half a century, Pope Scientific Inc. has been at the forefront of manufacturing chemical processing equipment, engineered systems and laboratory apparatus for science and industry. Today, Pope is internationally known – with specialized technical expertise in design and manufacturing of distillation processing equipment, as well as toll processing services. And, Pope Dewars have been in labs forever. Our long history demonstrates how clients have brought both routine and difficult and demanding separation/purification/mixing applications to us to make their solutions a reality…why we are solution driven. Located north of Milwaukee, Wisconsin, in Saukville, Pope moved into a 44,000 square foot manufacturing facility to support increased engineering, construction areas, technical and testing labs, glassblowing facility, shipping /storage and a fully equipped toll processing area. Pope’s short path/wiped film stills, evaporators, molecular stills, fractional distillation columns, hybrid still configurations, vacuum distillation, batch and continuous distillation stills, skid-mounted systems, portable processing systems, mixing vessels, high shear mixers, Nutsche filter dryers, liquid handling systems, manual agitators, glassware and liquid nitrogen Dewars can be found working daily in laboratories, universities, R & D departments, large and small corporations throughout the world. Pope Scientific has been at the forefront of manufacturing chemical processing equipment, engineered systems and laboratory apparatus for science and industry. Today Pope is internationally known - with specialized technical expertise in design and manufacture of chemical processing equipment. © 2019 Pope Scientific Inc. All rights reserved.